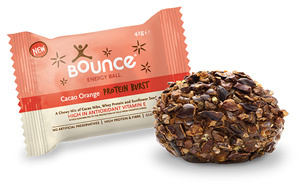 A zesty new addition to the team, bursting with natural goodness from Cacao nibs, rice bran and high quality protein. This all-time favourite combo delivers on taste and nutrition – proving there’s no need to compromise. 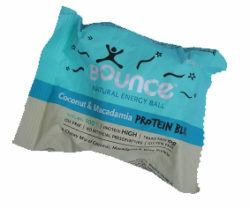 For orders to Australia and New Zealand please note that we cannot send nuts, seeds or any food items (this includes items such as green mixes, Bounce Balls, Great Greens, herbal teas etc.) due to import regulations. Brown Rice Malts Syrup, Sunflower Seeds (19%), Cacao Nibs (13%), Whey Protein Isolate (from Milk) (12%), Concentrated Grape Juice, Whey Protein Concentrate (from Milk) (4.5%), Rice Bran, Cocoa Powder, Brown Rice, Pea Protein, Flavourings, Stabiliser (Guar Gum), Tapioca Starch, Vanilla Extract, Sea Salt, Antioxidant (Natural Mixed Tocopherols), Citric Acid, Stabiliser (Calcium Carbonate), Emulsifier (Sunflower Lecithin).